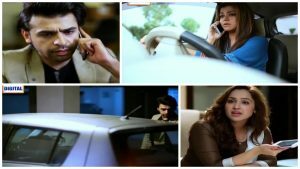 Teri Chah Main Episode 12 Review – Jal Kukri Mehwish! So it continues. This episode again focused on Mehwish’s insecurities and jealousy, the desperate hunt for a husband for Zara, Faisal’s long reflective ponderings – until the last ten minutes of the episode which then seemed to pave the way for new happenings. Mehwish is keen to have Zara married and while she claims it is because she thinks it is best for Zara to be married, I had my doubts about Mehwish’s ulterior motive and Faisal seemed to echo my thoughts. I do not understand how Zara being wedded off quickly is good for her in any way when she is clearly still in college and surely can wait a few years. From society’s point of view too, with Mehwish and Faisal’s marriage still so new maybe waiting a while would make sense too in the hope of having people forget the whole ‘scandal’. Then one can not forget all the ‘Zara should be an independent, educated, confident woman’ speeches then seriously why this desperate rush? Only thought that comes to mind, which Mehwish has clearly actually stated and now Faisal says is that with Zara wedded and gone, Faisal can move back in. I mean, seriously? I may not want to judge Mehwish for marrying a younger man, daughter’s ex fiancé and all that but this is rather hard to stomach. She insists she knows what is best for Zara but I was surprised that she did not even feign outrage over Faisal’s comment. Anyways, with Faisal thrown out and living right opposite the ever caring Amber and her mother, he is beginning to grow close to them. Does this guy have no friends? Hobbies? With Mehwish being shown in an ever increasing negative light, Faisal seems to be even more angelic. He is genuinely concerned about Zara, genuinely concerned about his neighbours, genuinely in love and upset over his wife’s attitude. Uggh! Itna genuine keh bechara after rendering his services to others all day he has to resort to a candle lit (well, unlit) dinner of – bread and milk. It is quite obvious where the writer is going with Mehwish and Faisal’s track but somehow I am not feeling ‘poor’ Faisal. Oh well. If there was any confusion over shades of white and black or grey in Mehwish’s character – it has been pretty much wiped out. Mehwish is insecure, jealous, petty and then some! Her character is shown to be a woman who has now stopped being a mother, a friend, a neighbour, a compassionate human being and all she is now is a possessive, jealous, suspicious wife. Period. Her demanding Faisal leave work and come to the apartment then not answering his calls, all this pouting and flouncing is so unbecoming! I wish her character was not shown to be so negative for I would have liked to see this drama tackle this track of their marriage while they remained the ‘normal’ish people they originally were rather than painting Mehwish openly as the evil one, giving Faisal a free ticket to stray which it seems he eventually will. Saggi maa itnay maan se sawaal nahin daalti jitna Elfy Aunty does! But the end of this episode saw her passing away, leaving Amber all alone in the world. It seems so predictable where this is going but let’s see. Another new character was also introduced – the new neighbour that pays Zara a visit. Wonder what his role will be – surely not a prospect for Zara? Is it just me or did anyone else feel that they were turning their heads at odd angles during some scenes? Such as when Faisal goes to the apartment and the elevator scenes. I admire experimenting with direction but a bit longer and I would have a crick in my neck! I am pleasantly surprised to see Saboor Ali’s toned down acting and hope I have not spoken too soon. Maria Wasti as Mehwish has finally come through for me as has Farhan Saeed as Mother (Teresa) Faisal. I started reviewing this drama because I liked the fast pace, the storyline was different and above all how the characters had not been judged and had their fates sealed as they seem to have done now. But the past few episodes have only highlighted Mehwish’s insecurity and Faisal’s mazloomiat so we get it, can we move on now? With Amber’s mother’s death, it seems that the story will move along – I sure hope so! What did you all make of this episode – would love to hear your thoughts!